Potli Samosa or Vegetable Samosa or Veg Samosa. Veg Potli samosa aka veg money bags are delicious Indian snacks of spiced aloo and mix veggies stuffed in flaky samosa dough, which is we shape into potlis and then deep fry it. 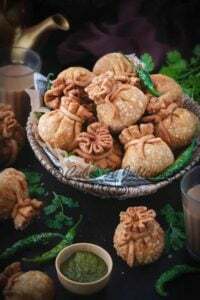 These veg samosa recipe makes a great evening snacks along with the adrak wali chai during winters or monsoon. It is an extremely simple and easy recipe to follow though a little time consuming but worth the effort. These crisp veg samosa potli can be a great snacks as a starters or appetizers and even for kids tiffin boxes. The variations that goes can be as a paneer potli or chicken keema potli and even corn cheese potlis. Here is how to make vegetable samosa recipe at home…. Who does not love a snack along with tea and coffee in this beautiful rainy season? It is already raining pleasantly across the country aur usme chai – samosa be it Chinese samosa or Punjabi samosa, is just too much fun. A twist to this samosa is yet another desi punch. Potli samosa is a very famous snack item in Uttar Pradesh and neighboring northern areas. Enjoyed by all, vegetable samosa potli along with hari chutney in breakfast and hi – tea. 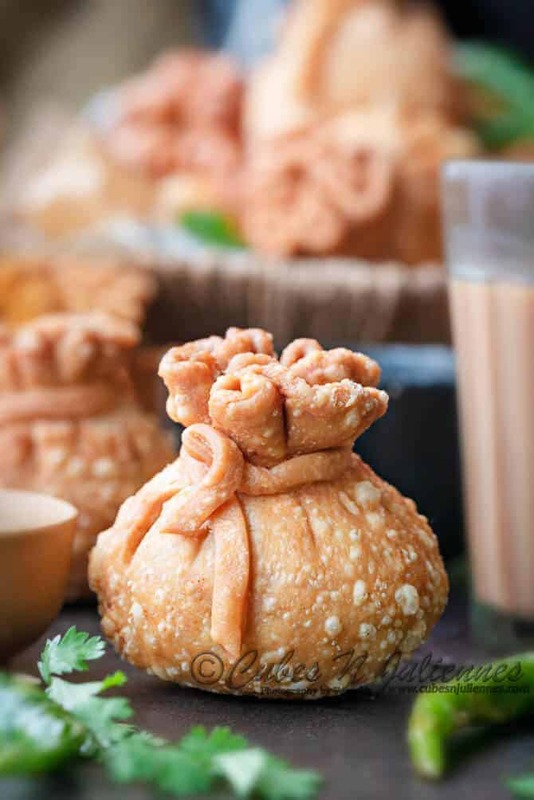 Potli Samosa is an authentic deep fried snack that pairs best with chutney and adrak wali chai. Potli here in India means packet or money bags. It is a deep fried snack pack with veggies and potato stuffing, hence we call it vegetable samosa or veg samosa. It is referred to samosa because the shell of the Potli is made of all – purpose flour. And because of the stuffing inside the samosa, the potli and the regular samosa are siblings but yet different in their characters. A delicious Indian snack which we Indians usually serve it with the tea. But yes! do not confuse yourself between a triangle samosa and the potli samosa recipe. How To Make Potli Samosa? For potli samosa recipe, we will be making using a dough from all – purpose flour i.e. maida. Then, we have to roll samosa dough into small round roti, stuffed with the desired filling. Gently, shape it into a Potli (packet or moneybag). 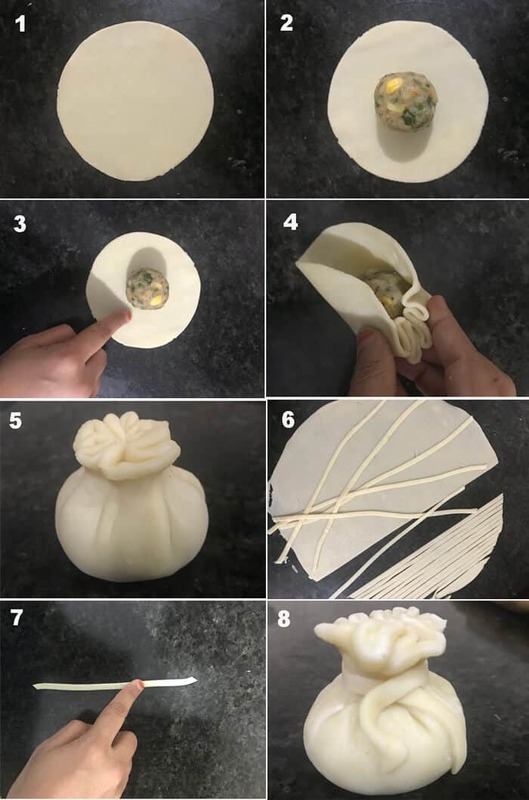 To make it look exactly like a potli or moneybags, you can tie a dough knot as well like how I have done below. Since these Potlis are not shallow fried, so you may need good amount of oil to deep fry these luscious vegetable samosa potli. This fried snack tastes perfect only when making with maida. The Atta i.e. the wheat flour which we use to make roti / chapati would not be as pleasurable as maida. Can We Freeze Potli Samosa? Actually, it is always best to fry and enjoy the potli samosa recipe on the same day. However, if you are planning to make it ahead, you can freeze it individually first on the tray seperating them from each other. Then, gather them and transfer it to the ziplock pouch and store in a freezer for a month. Furthermore, you can also, refrigerate these potli samosas for good 24 hours. The veg samosa stuffing can also be stored in a refrigerator for 2 days. Another interesting part is, you can freeze the samosa dough also. Just that, thaw it on a counter for sometime and then proceed with making the vegetable samosa potlis. Can We Air Fry the Potli Samosa? Yes indeed, you can air fry these veg money bags or vegetable samosa. Just that, before airfrying them, apply the brush them with oil and proceed. Veg samosa will surely be yummy and crisp, but the evenly brown potlis may not be as good as deep frying them. We need, maida (all-purpose flour), salt, oil and water for kneading the dough. The other the ingredients for potli samosa dough is we will be mentionng now. For the potli samosa stuffing inside, since it is a vegetarian samosa, I am using variety of vegetables. Indeed, you can use, your choice of veggies as well, even mushroom can be the part of these veg samosas. The veggies includes, cabbage, carrot, beans, capsicum, peas, corn and ofcourse potatoes. 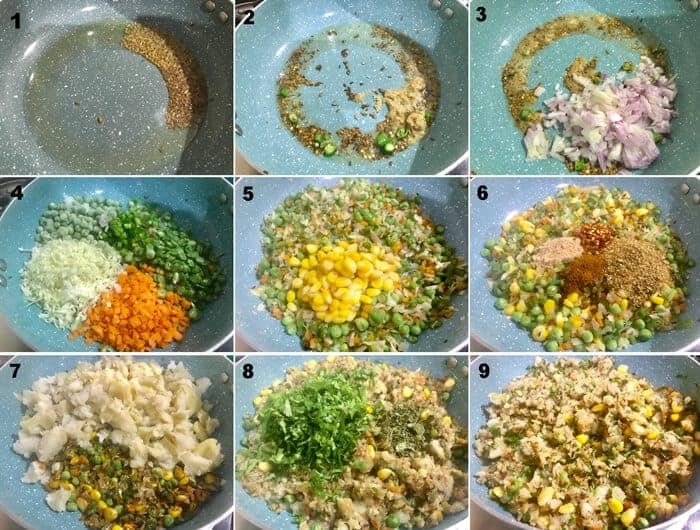 The stuffing spices are coriander seeds, garam masala powder, chili flakes, amchoor, onions, ginger, cumin seeds, fennel seeds, green chilies, kasuri methi, coriander leaves. And, a good amount of oil for frying the potli samosa recipe. For deep frying the vegetable samosa potlis, you can use any good vegetable oil for deep frying this lip smacking tea time aloo snack. Can We Make Veg Samosa Vegan? Yes, these veg samosa potlis or veg money bags are vegan like any other Indian samosa recipe. So, this makes the best vegan potli samosa recipe option as a snacks or appetizers for any party, festival or occasion. Sides to Serve with Vegetable Samosa Potli? You can serve this golden crust fried vegetable samosa along with tea and variety of chutney of your preferences. Green mint-coriander chutney, imli chutney or tomato ketchup is absolutely your choice. There is no better combination of the snack as with soul comforting adrak wali chai. To begin with, an a bowl, add white flour and salt, mix well. Then add 7 tablespoons of oil and start mixing the dough with the help of fingers. Mix the flour mixture until crumbly. Then, add few tablespoons of water to the flour mixture and start kneading the dough. Do not add too much water at a time. Knead it well to form a stiff dough. Then, cover the dough with a damp cloth and keep it aside for 45 minutes. Once the dough rests weel, then give a knead and divide the dough into a small lemon sized balls. We will need one dough ball for making the string of the potlis. So, its like if we are making 18 samosas then we need to make 19 balls, where the 16th ball will be bigger sized ball. So, divide the dough accordingly. First, start with heating the oil In a pan. While the oil heats, add cumin seeds, fennel seeds and allow it to crackle. Now, add ginger, chopped green chillies and fry for another few seconds. Then, add onions and fry until translucent. Finally, add mashed potatoes and mix well. Allow it to cool completely, samosa filling is ready. 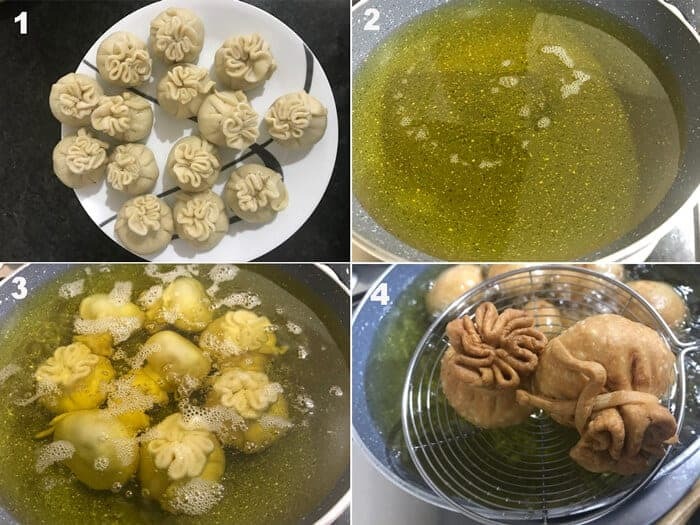 The dough has been divided into small balls, similarly, divide the stuffing for all the lemon sized balls made except one. Now take a ball, roll it out into a thin disc of about 4 to 5 inches. Then, take a stuffing portion and place it in the center of the rolled disc. Now brush the edge of the disc with water. Then, bring the edges together to form a potli (like a money bag). Gently, press and seal the potli well taking care of the stuffing to be secured well within. Repeat the same for all the potlis. Now, take the extra dough ball and roll it out into a thin disc. Cut it into thin strips of 5 to 6 mm width. Take one strip, brush it with water and carefully tie around the neck of the potli. Gently, press to secure the potlis. Repeat the same for all the potlis. Now, heat enough oil in a deep pan or kadhai. Oil should be just warm. Gently, slide in the potlis and fry them until brown and crisp. Be careful while frying them. AFter the potlis are put into the oil, leave it undisturbed for few minutes to avoid the breaking of the strings. The frying procedure for each batch will take about atleast 25-30 minutes. Maintain low heat through out while frying the potlis. Once vegetable samosa is brown and crisp, take them out onto a paper towel. Potli samosa is ready to be served. 2. Then, add few tablespoons of water to the flour mixture and start kneading the dough. Do not add too much water at a time. Knead it well to form a stiff dough. 3. Then, cover the dough with a damp cloth and keep it aside for 45 minutes. 4. 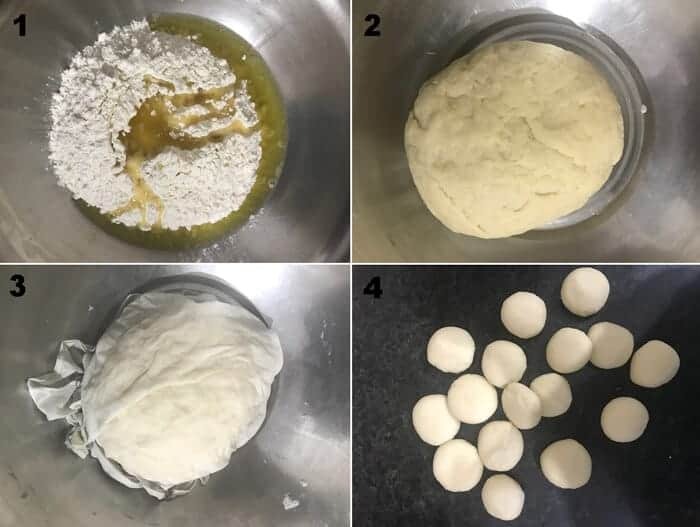 Once the dough rests weel, then give a knead and divide the dough into a small lemon sized balls. We will need one dough ball for making the string of the potlis. So, its like if we are making 18 veg samosa then we need to make 19 balls for potli samosa, where the 16th ball will be bigger sized ball. So, divide the dough accordingly. 2. Now, add ginger, chopped green chillies and fry for another few seconds. 3. Then, add onions and fry until translucent. 7. Finally, add mashed potatoes and mix well. 9. Allow it to cool completely, vegetable samosa filling is ready. 2. Now take a ball, roll it out into a thin disc of about 4 to 5 inches. 3. Then, take a stuffing portion and place it in the center of the rolled disc. 4. Now apply or brush the edge of the disc with water. 5. Then, bring the edges together to form a potli (like a money bag). 6. Gently, press and seal the potli well taking care of the stuffing to be secured well within. Repeat the same for all the potlis. 7. Now, take the extra dough ball and roll it out into a thin disc. Cut it into thin strips of 5 to 6 mm width. 8. Take one strip, brush it with water and carefully tie around the neck of the potli. Gently, press to secure the potlis. Repeat the same for all the vegetable samosa potli. 2. Now, heat enough oil in a deep pan or kadhai. Oil should be just warm. 3. Gently, slide in the potlis and fry them until brown and crisp. Be careful while frying them. AFter the potlis are put into the oil, leave it undisturbed for few minutes to avoid the breaking of the strings. The frying procedure for each batch will take about atleast 25-30 minutes. Maintain low heat through out while frying the potlis. 4. Once vegetable samosa is brown and crisp, take them out onto a paper towel. Potli samosa is ready to be served. Thinking of try this recipe coz it sounds amazing. But can I use ready samosa Patti instead of making the dough. Look at those beauties. What a master piece of art cooking is!!! Made them today, but I wish I too could someday get them as beautiful as you have made.